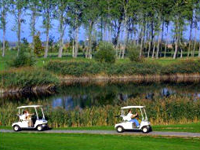 A golf tour to Hungary offers unique holiday experiences for the golfers with pleasant golf playing, delicious winetastings and authentic experiences in the heart of Europe. From some of the most famous, popular golf challenges, to real hidden gems, Hungary has diverse range of golf courses to please everyone. The country awaits you with unique combination of golf, culture, gastronomy and wellness and provides the ideal facilities to relax, revitalize and enjoy the peaceful environment. Golf courses framed by beautiful lakes, mature trees and sloping hills present a challenge for golfers of all standards. Although golf appears to be just getting a start in Hungary it actually has a long and charming history. The first introduction of golf in Hungary was organized by Baron Géza Andrássy at the racecourse in 1902. The first course was built in Tátralomnic and the first competition was organized here in 1909. The constructor of the course, Dezso Lauber was the president of the club, the secretary of Hungarian Olympic Committee and later multiple Hungarian golf champion. Today seven professional golf courses in beautiful surroundings await lovers of the sport of golf. Hungary is not only renowned for its excellent courses, but also for its cuisine and thermal springs, providing a perfect opportunity to combine a round of golf with a good meal and some wellness – at practically every golf club. Location: The nearest and most exclusive golf club of Budapest, only 20 minutes from the city center at Göd. More information can be found about the hotel at our accommodation point/golf hotels! Location: The resort is to be found in the south-west of Hungary at Hencse. It is 40 km from Kaposvár and 230 km from Budapest. 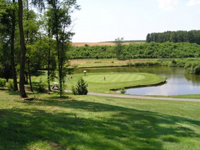 Location: The golf course is situated in Mariavölgy about 40 minutes from Budapest city center. The approach to the course and clubhouse is through a beautiful alley of towering 200 year old sycamore trees. Location: The resort is located in Western Hungary, at the border of the Alps and the Small Flatland, in the valley of the Répce River. It s just a 90 minutes drive from Vienna, Graz and Bratislava and a little over two hours away from Budapest.